A rare set of tableware designed by Pierre Vandel for Pirre Cardin, finished in brushed aluminium and dating from the 1970's. Comprising of three posy vases, bottle opener, nutcracker, four eggcups, pair of large candle holders, pair of small candle holders, six knife rests, salt and pepper Shaker, two napkin rings and ashtray. Dimensions: Posy vases: Small vase 6.5" H, Medium vase 8" H, Large vase 9.5" H. Large candlesticks holders: H 0.6" x D 3.94" Knife rests: H 4.75 in. x W 3" x D 0.75" Small candlestick holders: H 0.79" x D 2.76" Egg cups: H 1.75" x W 1.75" x D 1.75" Ashtray: H 1.5" x W 4.75" x D 4.75" Bottle opener: H 1.5" x W 4.75" x D 4.75" Nutcracker: W 2.5" H 1.75". In good condition, Nutcraker has wear to edges. 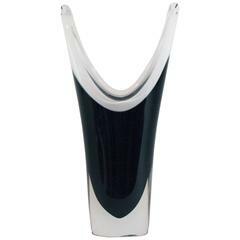 A cased glass vase designed by Swedish glass artist Paul Kedelv for his &quot;Coquille&quot; series produced by Flygfors. Elegant modernist nut cracker works with a screw highly decorative minor surface scratches on some sides rare.